Heat Level: 4 flames – saucy but not overly graphic. I was unsure if I’d like this novel because though I’m a monster/creature addict selkies aren’t among my list of most intriguing creatures. What a delight however when the book hooked me from the first sentence all the way through to the end – it was a long lounge in the sacred pool! It brilliantly merges aspects of the selkie character (pelt/skin) and the something (indicating she might not be human) with the character’s driving desire (goal) at that point. Kantra melds those and is able to accomplish a solid hook all in one neat opening sentence. The story is tight with each introduced character playing a role in the hero or heroine’s fate. Her descriptions are short and vivid, bringing the reader into the world without excessive (and dull!) droning of details. Her focus on the character’s thoughts and emotions are laser sharp and focused – never wandering into what I term the ‘blah blahs’ (you know, when the author falls prey to diarrhea of the pen and you just want them to shut up already and get back to the story!!). The tension between the hero and heroine is taunt and believable. I truly enjoyed how she pulled off an adult relationship with realistic drama instead of the sometimes childish and inane theatrics some romance stories fall prey to. It’s an excellent story with fantastic characters told by a stellar writer. 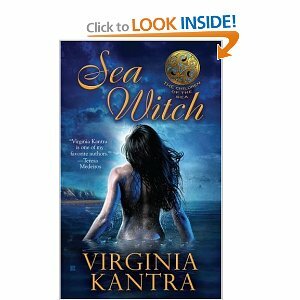 I’ll certainly be picking up the next book in the series – Sea Fever.